In Dutch oven, cook sausage over medium-high heat 5 minutes, stirring frequently; drain. Add onions, bell pepper and garlic; cook and stir 4 to 6 minutes or until bell pepper is tender. Stir in remaining ingredients except spaghetti. Reduce heat; simmer 20 minutes. Meanwhile, cook spaghetti as directed on package; drain. Remove bay leaf from sauce. 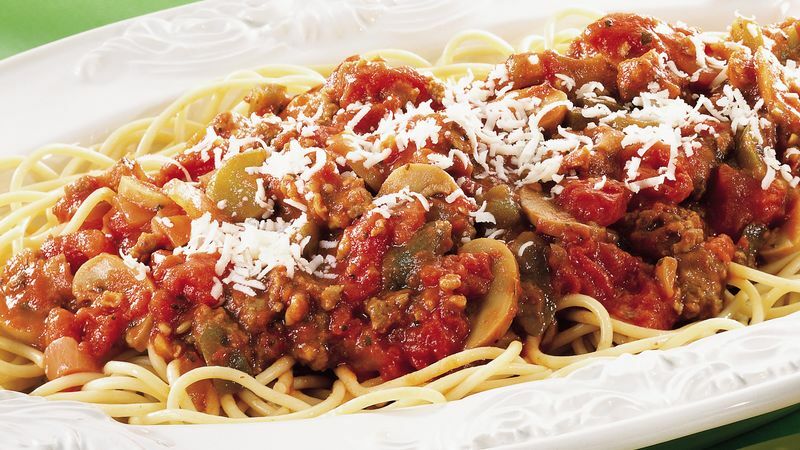 Serve sauce over spaghetti. Sprinkle with grated Parmesan cheese if desired. PET is a registered trademark of Multifoods Brands, Inc.